A friend once admonished my grumpiness on my birthday (when I passed a certain decade figure, not to be mentioned) by saying she was glad I’d been born. Well, I’m glad you were born, Will. And I thank you. Thank you for being a writer. Thank you for being an actor’s writer. Thank you for writing plays for yourself and your friends to act. Thank you for writing for your own time. Thank you for writing those simple truths that know no century or country and make your plays speak to generation after generation. Thank you for the histories, which taught me enough to understand Wolf Hall. Thank you for the comedies and the love and the laughter. Thank you for the tragedies that challenge every actor to be worthy of them. Thank you for Beatrice, Helena, Luciana, Olivia and Viola, Portia, Hermione, Kate, Bianca, for Goneril and Regan, Cordelia and Hero, Isabella and Lady Anne, for Cleopatra and Calpurnia, for Celia and Rosalind, Helena and Hermia, for the Countess, the Courtesan, Imogen and Marina, Dionyza and Lady MacB, not to mention Lady MacDuff, too many to list, even though there were so few women in each play. Thanks for Hamlet and Richard II, Henry VI and Falstaff, Petruchio, Edmund, Edgar…Osric... and all the rest. 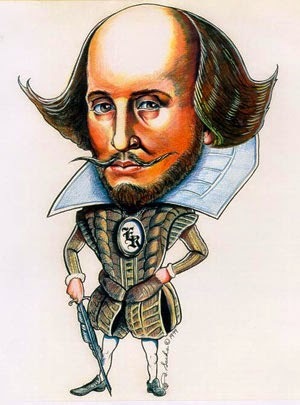 And although you didn’t write it, you clearly inspired it, so thanks, too, for “Something Rotten.” Happy Birthday, Will. Many, many joyous returns of the day. ~ Molly Matera, logging off to watch “Playing Shakespeare,” or Branagh’s “Much Ado,” or maybe Orson’s version of the Scottish play, or David Tennant’s "Hamlet,” or , or, or….. The most exciting and discouraging aspect of a good production of a 134-year-old play is its timeliness. 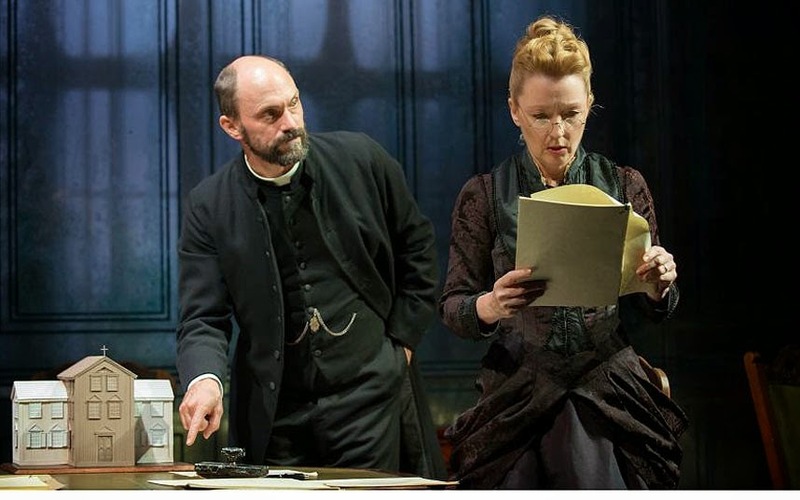 The Almeida Theatre and Sonia Friedman Productions company has brought Henrik Ibsen’s Ghosts to BAM. 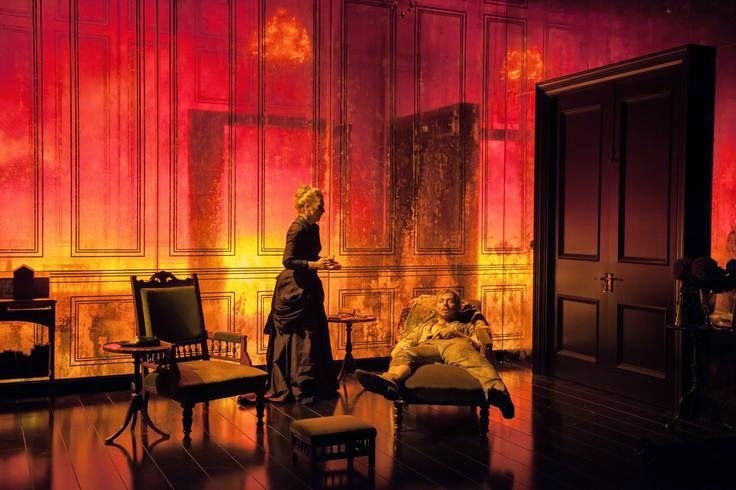 This 95-minute adaptation by director Richard Eyre of Ibsen’s scandalous 1881 play is beautifully produced at the BAM Harvey Theatre, with a 19th century living room backed by a dark scrim through which we could see the 19th century dining room. The smooth design of the play was gorgeously integrated, the scenic design by Tim Hatley merged with the lighting design by Peter Mumford and the sound design by John Leonard. Before the first word is spoken the play is set in its time, place, and mood. In 1881, Ibsen’s play shocked its readers and reviewers, dealing as it does with adultery, deceit, debauchery, and syphilis. In 2015, when it appears nothing shocks us, we are still dealing with similar brainwashing. Yes, I call it that when a woman takes responsibility for a man’s actions. More than a century later, this attitude still resonates. It happens today (“look what you made me do”) and in 1881, the society, the church, and the people themselves put an unbearable load on the backs of women. The main character has been dead for ten years. An orphanage donated by his widow will be dedicated on the day the play occurs, named after the Honorable Captain Alving, a misnomer. Mrs. Alving is excited, this has been a long time coming. Better, her son, who lives abroad, is home and promises to stay the winter. Her little maid is a local girl who practices her French on Mrs. Alving and the lady’s business manager and pastor. The son, an artist, sleeps late. Oh, and there’s the maid’s father, a typical drunken brute with whom the girl Regina does not wish to live She is part of the Alving household and wishes to remain so, in any capacity. That’s the set-up. By the end of the play, the dishonorable “honorable” Captain Alving is revealed to all, his orphanage is burned down, and his name will now be attached to a proposed home for sailors we’ve nodded and winked about all evening. The Alving line ends here, onstage, with the only legitimate son suffering from inherited syphilitic fits before us. That’s not a spoiler in a play first produced in 1882. Mrs. Alving has known and hidden all these years that her husband was a debauched drunkard who took his sexual pleasures wherever. She did her duty as a married woman, protected her son from his father as best she could, and made the family rich with her business acumen disguised as her husband’s. The bull-headed pastor for whom she had unreasonable affection insisted she did her wifely duty. We are shocked to see her response when she first hears the “ghost.” The “ghost” is a repetition of a sound, a sound Mrs. Alving heard when she realized her husband was having an affair with the maid, under Mrs. Alving’s own roof. In the dining room. The same sounds, the same murmurs recur with her son in the dining room with the maid. But wait, it gets better. The maid in the present dining room is the illegitimate daughter of Captain Alving and that other maid, and therefore half sister to young Oswald Alving. Stakes rise. When Oswald’s behavior echoes that of his father, he raises the Ghost, causing all the truths to come out in exorcism. The revelations of the last act affect each character differently, but Mrs. Alving’s final revelation was the most distressing. She seems to believe that, since Oswald wants the same things his father wanted, that this meant that Alving Senior’s profligacy, drunkenness, carousing and multiple adulteries were her fault. A distressing reaction. I’m still bothered. That’s the effect the theater should have on its audience, days later, and longer. The son’s fits at the end of the play were disturbing and heart rending. The fact that Mrs. Alving and her son were totally alone in that big house was fitting as lights dimmed red into that dark dawn. Dawn for Mrs. Alving and Oswald Alving. 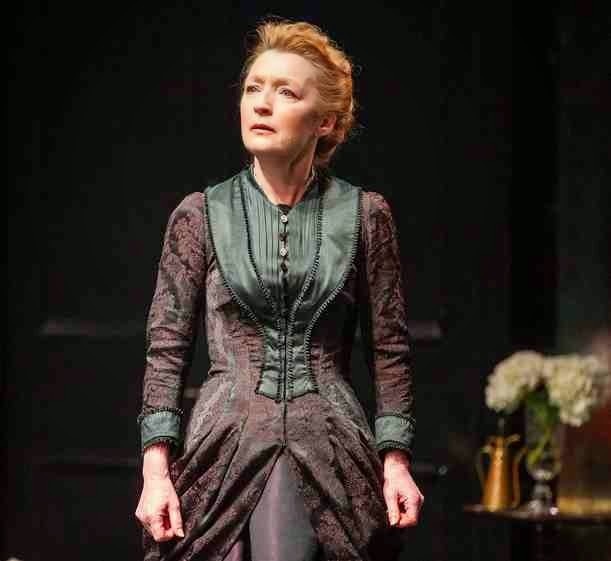 Lesley Manville is a wonder, always a living, thinking, feeling human being on the stage, listening without artifice when the other characters — and the audience – focus away from her. Sometimes beautifully still, always controlled, Lesley Manville as Mrs. Helene Alving was fascinating to watch and hear. She held us all in her thrall from start to finish. The evening was hers, as Ibsen intended. Brian McCardie as an Irish version of Jacob Engstrand was rather standard as a habitual drunk, the alleged father of Regina, known to the region as unreliable at best. He has a dream and a scheme woven through the lives of the other characters. Mr. McCardie’s performance held no surprises. Charlene McKenna as Regina Engstrand was a bit much, playing “young,” eager to please, too jumpy. Perhaps that’s what Mr. Eyre directed her to do in order to appear young and energetic and potentially joyful, but it didn’t ring quite true. Will Keen as Pastor Manders was on the mark to the point that he annoyed me. It’s right there in the lines that the man doesn’t listen, and Keen inhabited Manders well, showing us a man who is so sure of himself and his faith and his place in society, and everyone else’s place in society, that he hasn’t listened in decades. His narrow beliefs, uncompromising and unfeeling ways, lead to his destruction, and Mr. Keen’s tightly strung body was on the verge of collapse once he realized he had indeed destroyed the orphanage and subsequently his own soul. Billy Howie played Oswald Alving as about 17, although I believe he’s supposed to be in his mid twenties. He was sulky, spoiled, and totally his father’s son, and the only person who couldn’t see that was his mother. But she heard it at last as he was ready to repeat his father’s history with the maid. Mr. Howie’s final scenes were harrowing and heart-rending and brought the play to a shocking climax. I liked Richard Eyre’s adaptation, I feel it captured the spirit of the original without being bogged down with 19th century verbosity. 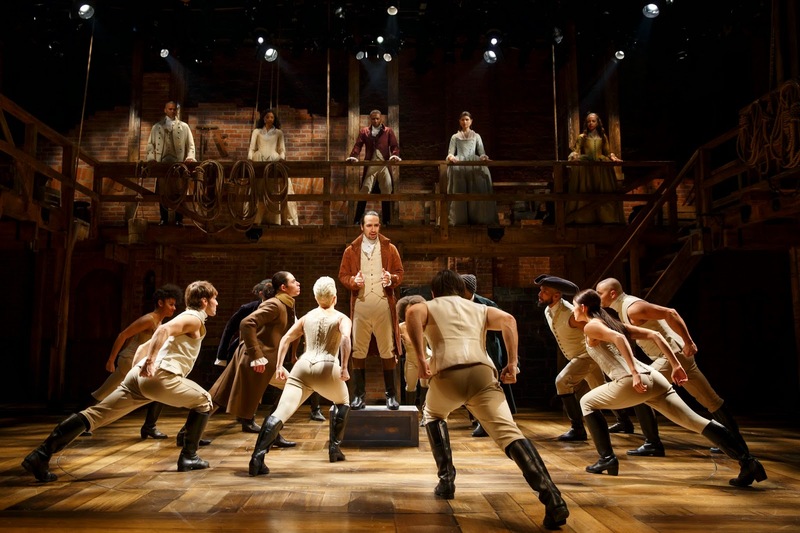 Good theatre is supposed to make us feel and think, and sometimes change comes of it. Ibsen played his part in the early days of the quest for women’s social equality to men. The quest is not yet realized, it is not won. 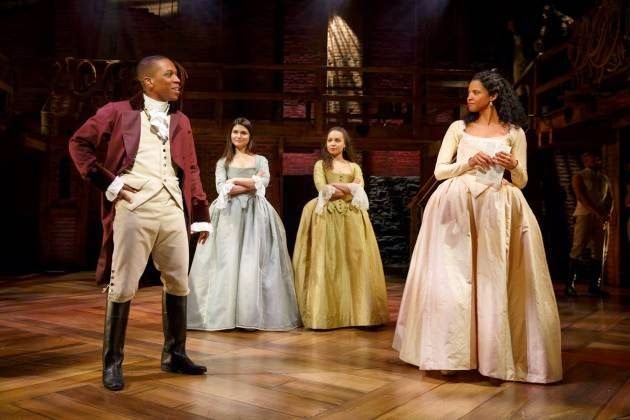 For this play, a 21st century adaptation reminds us that while some advances have been made, it’s not enough. Ibsen’s fears live on. 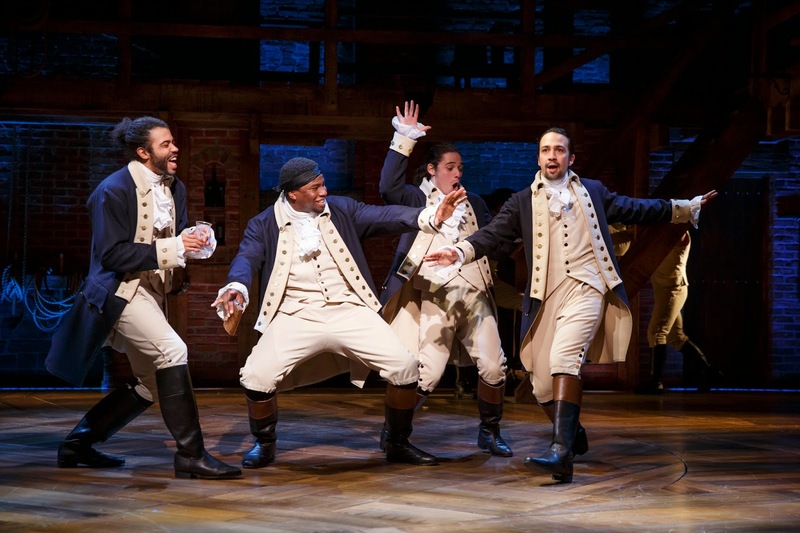 ~ Molly Matera, signing off with a recommendation to see this production of “Ghosts,” playing at BAM through May 3, 2015.